Punk is an attitude. I don’t win any journalistic awards for pointing out that hackneyed nugget of insight. It’s been stated a millions times before. It’s just that these two young bands embody that ethos so acutely. War Coma (bloody good name) hail from the Manchester area and offer four driven and intense tracks of fiercely DIY punk/HC. ‘The Hunger’ charges out the speakers in a fast-but-not-blurring-fast tempo of scowling angst and spiky righteousness. Over hoarse and pissed off vocals and two busy and intense guitars that twine and coil around each other like black wisps of Stockport factory smoke, a suicidal phlegm of dark despair and world-weary rage is hawked-up and spat out. 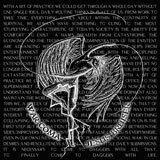 War Coma mix punk, HC and some post-rock influences to come up with a sound that is as sensitive and finely constructed as it is earnest and fucked off. Bristolians Jesus Bruiser follow a similar tact to their comrades but employ a twin vocal attack that really adds extra fury. Five tracks of frothing punk polemic sign and seal their contribution. ‘Palestine’ rails against the fascist Zionism (so sickeningly ironic in the context of WWII) of contemporary Israeli politics with a blast of furious chord-driven punk that slows to a brooding and almost soothing climax and ‘Black Metal’ derides the moronic neo-Nazi fixations of certain Scandinavian black metallers. It’s fascinating to listen to these two bands and to grasp how much punk has evolved over the last three decades. Essentially much hasn’t changed, but on closer inspection, both bands start to reveal all kinds of disparate influences, from the experimental guitar intensity of post-rock heroes like Godspeed You Black Emperor! to the tightly wound chaos of much 1990s HC like His Hero Is Gone and Converge. I can even hear grizzled old UK anarcho-mongers Conflict in there too, although I’m sure neither band would cite them as a conscious influence. Listening to this also makes me realise how so many bands don’t bother with politics anymore. It’s just not ‘in’ is it? There’s no smug ironic metal imagery or pseudo-occult posturing here – just good old-fashioned punk rock fury. This lovingly-crafted split is available via the bands myspace pages or from the Pumpkin Records website. It’s wrapped in a beautiful recycled sleeve, with original artwork and lyrics on a little folded insert sheet. Just like the old days. Worth a few quid of any fuckers dole money!